Be quiet my trembling heart! In a recent interview with Apple CEO Tim Cook, he was asked whether any of Apple products would ever be made on our shores. 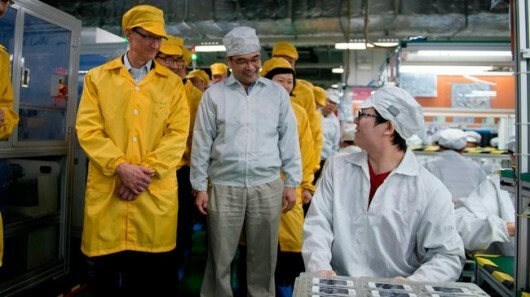 Mr. Cook indicated that he “hopes” Apple could actually assemble its products in the US. Cook also stated that Apple “will do as many of these things as we can do [in America], and you can bet that we’ll use our influence to do it.” Wow, is that a commitment to domestic manufacturing! Let’s attempt to decipher Mr. Cook’s cryptic statements. I am imagining what factors could possibly crush Mr. Cook’s “hope” that Apple could assemble its products in the U.S. Its products are assembled in China by Foxconn workers, most of whom don’t have any special skills. We have lots of people in this country who would probably be interested in a steady job assembling iPhones and iPads. Given labor laws in this country, they probably would not be able to work the shifts that Foxconn workers endure. And you would have to pay them more. But since labor is such a tiny percentage of the production costs of an iPhone or iPad, shifting assembly to this country is not going to cut Apple’s profit margin to the bone. I am a bit puzzled by this idea. I use my influence, what little I have, to get my son to clean up his room or to convince my wife that we should eat Thai as opposed to Chinese food. We typically use our influence to get other people to do things we wish them to do. But Mr. Cook was talking about what Apple, as opposed to someone else, will do. I mean if Apple decides to assemble its products in the U.S., it doesn’t have to use its influence, it just has to make the business decision and shift production. If I had been at the meeting with Mr. Cook, I would have asked a follow-up question after his “influence” response. This entry was posted in american made, Apple, China, iPhone, Made in America, made in usa and tagged Apple, China, Foxconn, iPhone, Made in America, Made in the USA, Made in the USA products, Tim Cook. Bookmark the permalink.